In the 1890s, the English physician Archibald Garrod was called upon to examine Thomas P, a three-month-old boy whose urine was a deep reddish-brown. His diagnosis was alkaptonuria, which is caused by a buildup of homogentisic acid (alkapton), a compound that the body normally breaks down rapidly. At the time, the prevailing thought was that alkaptonuria, a rare disorder, was caused by a bacterial infection; Garrod conceived it to be a disease associated with chemical reactions. Two subsequent siblings of Thomas were born, each with alkaptonuria, from parents who were blood relatives. Further investigation revealed to Garrod that in other families having one or more children with alkaptonia, in every instance, the parents were first cousins. He published these findings in 1902. Based on his appreciation of Gregor Mendel’s rules of inheritance and his knowledge of chemistry, Garrod concluded that some diseases might represent inherited disorders of metabolism, and these he described in his classic 1923 text Inborn Errors of Metabolism. IEM, also called inherited metabolic diseases, are associated with a single defective gene, resulting in the absence or production of an abnormal specific enzyme required to carry out a metabolic reaction. Most abnormal genes are inherited in an autosomal recessive manner—that is, the child must inherit copies of the defective from each parent. IEM represent a large group of disorders in which the body cannot convert food into energy or other essential compounds. As a consequence, the body builds up substances that are toxic or interfere with normal body function or that reduce the body’s ability to synthesize essential compounds. The outcome may range from harmless to severe, even fatal. IEM, of which over two hundred have been identified, are traditionally classified based on the type of metabolism involved—namely, carbohydrate, amino acid, fats, or complex molecules. Each IEM is individually rare, but collectively, they occur in roughly 1 of every 4,000 live births, with the incidence varying among different ethnic and racial groups: sickle cell anemia, 1:600 of African descent; cystic fibrosis, 1:1600 of European descent; and Tay-Sachs, 1:3500 of Ashkenazi Jewish descent. SEE ALSO: Metabolism (1614), Mendelian Inheritance (1866), Enzymes (1878), Blood Types (1901), One Gene-One Enzyme Hypothesis (1941), Protein Structures and Folding (1957). 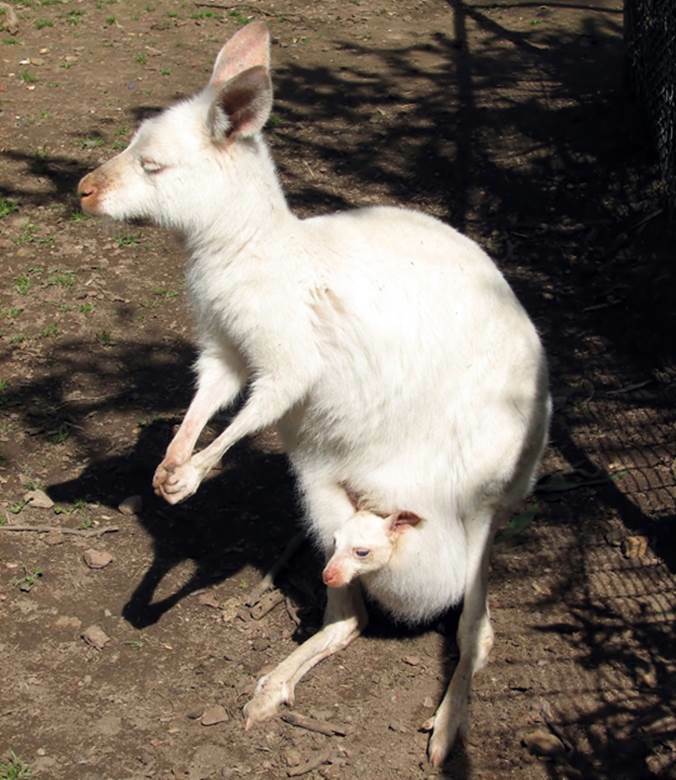 Albino kangaroos are variants of kangaroos that are usually red or gray. Occurring in many vertebrates, albinism is an IEM characterized by a defect in tyrosine metabolism that results in deficient melanin production.